As mindfulness is increasingly embraced in the contemporary world as a practice that brings peace and self-awareness, Bhikkhu Analayo casts fresh light on the earliest sources of mindfulness in the Buddhist tradition. The Satipa? ?hana Sutta is well known as the main source for Buddhist teachings on mindfulness and its place in the Buddhist path. 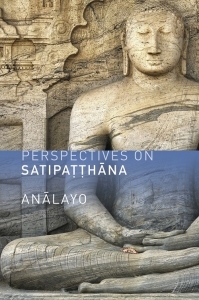 Ten years after Analayo’s acclaimed study of the Sutta, his current work, Perspectives on Satipa? ?hana, brings a new dimension to our understanding by comparing the Pali text with versions that have survived in Chinese. Analayo also draws on the presentation of mindfulness in a number of other discourses as they survive in Chinese and Tibetan translations as well as in Pali. The result is a wide-ranging exploration of what mindfulness meant in early Buddhism. Informed by Analayo’s outstanding scholarship, depth of understanding and experience as a practitioner, this book sheds fresh light on material that is central to our understanding of Buddhist practice, bringing us as close as we can come to the mindfulness teachings of the Buddha himself. "Analayo builds on his earlier ground-breaking work, 'Satipa? ?hana: The Direct Path to Realization'. The brilliance of his scholarly research, combined with the depth of his meditative understanding, provides an invaluable guide to these liberating practices." "He offers us a work of great scholarship and wisdom that will be of immense benefit to anyone who wants to seriously study or to establish a practice of mindfulness." "A treasury of impeccable scholarship and practice, offering a wise, open-minded and deep understanding of the Buddha’s original teaching." Bhikkhu Analayo completed a PhD on the Satipatthanasutta at the University of Peradeniya, Sri Lanka in 2000, published in 2003 by Windhorse Publications under the title Satipa? ?hana: The Direct Path to Realization. He has also written Perspectives on Satipa? ?hana (Windhorse Publications, 2014), a comparative study of parallel versions of the Satipa? ?hana Sutta. His other works include a habilitation research through a comparative study of the Majjhimanikaya in the light of its Chinese, Sanskrit and Tibetan parallels at the University of Marburg in 2007, published 2011. You can view a full list of his publications here. At present Analayo is a professor of Buddhist Studies at the Sri Lanka International Academy in Pallekele. He teaches at the Center for Buddhist Studies of the University of Hamburg and researches at the Dharma Drum Buddhist College in Taiwan. His main research area is early Buddhism and in particular the topics "Chinese Agamas", "Meditation" and "Women in Buddhism". Besides his academic pursuits, he spends about half of his time in meditation under retreat conditions and regularly teaches meditation courses in Asia and the West.